Mikala Kass from the School of Human Evolution and Social Change highlights the research on global water solutions being conducted by the Global Ethnohydrology Study, a project led by our very own co-PI Amber Wutich. Researchers often look at how people experience water issues in their communities, but these studies are usually focused on a single region. One interdisciplinary group of researchers from Arizona State University, however, is taking a cross-cultural approach to look at water knowledge and management around the world. In the most recent phase of the Global Ethnohydrology Study, this team interviewed people from communities in the United States, New Zealand, Fiji and Bolivia to see how perceptions of water risks and solutions varied depending on the community’s level of development and water scarcity. Brian Sodoma in the Arizona Republic highlights the focus of water research at ASU. In the desert Southwest, the word “water” can spark serious debate, and for good reason. Lake Mead’s bathtub ring reminds us that this precious resource is limited for the seven Western states — including Arizona — that rely on the Colorado River. That visual spurs talk about extreme conservation, or tapping unused water sources like seawater in the Gulf of Mexico. At Arizona State University, however, researchers say a shift in perspective is needed. ASU researchers are not merely offering a positive take on a serious issue, but providing an honest look at better management practices, interconnectivity of industry with water supplies and a thoughtful evaluation of existing and future needs. Here & Now’sMeghna Chakrabarti talks with Dave White at Arizona State University about why the lake is so low, and what happens if the level falls low enough to trigger mandatory water restrictions. Lake Mead along with Lake Powell, the two major storage reservoirs on the Colorado River system, are absolutely essential to the social, economic and environmental vitality for the entire western United States. Together, the reservoirs and the Colorado river system provide at least part of the drinking water supply to nearly 40 million people in the western United States, produce millions of megawatt hours of energy production, provide habitat for threatened and endangered species and produce a tremendous agricultural crop particularly during the winter months. Dave White is interviewed by AZCentral.com’s Brandon Loomis on Nestle planning a $35 million plant to bottle water in Phoenix. Sunday Square Off panelists Dave White, Sarah Porter and Kathy Ferris discuss Why new bottled water plant won’t make a splash in Phoenix. The water experts on the “Sunday Square Off” “Water Show” say a new bottled-water plant in Phoenix won’t make a big splash in the city’s water supply. But there are other issues. Steve Goldstein at KJZZ’s Arizona Science and Innovation Desk, interviews Dave White regarding the Southwest drought and its impact on Lake Mead and the Lower Colorado Basin. The Southwest drought continues, and its impact is being felt in Lake Mead. The Colorado River reservoir has shrunk to its lowest levels since the completion of Hoover Dam in 1936. The lake is only 37 percent full. They talked about what that could mean for Arizona and what some Western states are planning to do about it with Dave White, director of the Decision Center for a Desert City at Arizona State University. DCDC Water/Climate Briefing panelists share the good, the bad and the hopeful of water in the West. The Colorado River provides water for nearly 40 million people in seven western states, irrigating millions of acres of farmland, and generating thousands of megawatts of electricity. And though an official declaration of water shortage on the Colorado River has never been declared, and that careful planning has ensured Arizona and Colorado are well-supplied with water, residents need to know it’s a precious resource. That was the message Thursday as the water chieftains of Arizona and Colorado spoke before a crowd of about 100 at the Water/Climate Briefing Annual Keynote Event held by Arizona State University’s Decision Center for a Desert City. ASU researchers report on a range of topics at 2016 AAAS conference from effective team science to drones on the range, Arizona State University faculty and students played a big role in the annual meeting of the American Association for the Advancement of Science (AAAS). AAAS is the world’s largest science and technology society, and its annual meeting draws thousands of scientists, engineers, educators, policymakers and journalists from around the world. DCDC graduate research assistants presented their research at the AAAS student poster session on February 14, 2016. Arizona State University scientists Ted Bohn and Enrique Vivoni, of the School of Earth and Space Exploration, discuss a new technique in the journal Water Resources Research, which uses a combination of satellite imagery, field observations and models to estimate evapotranspiration – evaporation from soils and from plant transpiration. Evapotranspiration is an important component of the hydrological cycle and a major contributor to downwind rainfall. “Unmanned Aerial Vehicles (UAVs) are poised to revolutionize remote sensing in the earth and environmental sciences. They let individual scientists obtain low-cost repeat imagery at high resolution and tailored to a research team’s specific interest area,” said Enrique Vivoni, hydrologist and professor at Arizona State University. Vivoni did his research in the Sonoran and Chihuahuan deserts which cover large expanses of northern Mexico and the US Southwest. Using drones in these areas allowed the scientists for improved studies on land-atmosphere exchanges and vegetation-runoff interactions. Dave White facilitates a meeting of Western city mayor’s at summit. Cities in the United States’ Western region face a higher demand for water as populations grow and drought diminishes supply. That’s why the mayors of several Western cities recently agreed to work together on water sustainability and climate-change adaptation. “As they like to say, mayors have to get stuff done. They are problem solvers with very immediate constituencies,” said Dave White, director of Arizona State University’s Decision Center for a Desert City, a research unit of the Julie Ann Wrigley Global Institute of Sustainability. The meeting, called by Stanton as part of the annual U.S. Conference of Mayors convention here, drew mayors from Mesa, Los Angeles, San Francisco and Aurora, Colorado. It came against a backdrop of California’s historic drought, and on the same day that NASA and the National Oceanic and Atmospheric Administration reported that 2015 was the hottest year on record. Ducey Addresses Water Concerns to Ensure Long Term Security. One of the issues Governor Doug Ducey brought up in his State of the State address is water. He wants to look for new, long term water sources for the state. He also has given the state Department of Water Resources the go-ahead to use existing dollars to hire new staff. Dave White, co-director of Decision Center for a Desert City at Arizona State University, spoke about Ducey’s comments. Sara Weber from Cronkite News reports on the Western Mayors Water and Climate Change Summit: Local Leadership for Local Solutions in Washington, DC. Phoenix Mayor Greg Stanton had a message for the group of Western mayors gathered in the nation’s capital Wednesday to talk about water resources: It’s time to work together. The group later considered a list of principles from Stanton and Dave White, the director of Arizona State University’s Decision Center for the Desert City, that the two said would help each city implement water-conservation solutions. The list centered on educating constituents on individual water use through data and technology, while fostering a “conservation culture” among future generations. Brandon Loomis reports on growth in Arizona. This article in the Arizona Republic is based in part on interviews with DCDC researchers Dave White, Ray Quay and David Sampson. The article specifically discusses research reported in an article led by Pat Gober and published in the Geological Society of London in 2014. This is another example of how our research affects the public and policy discourse. Is Phoenix area’s long love affair with grass waning? Unlike in California – where some residents have taken home $3.75 per square foot to lose their grass – Valley rebates often don’t cover the full cost, said Kelli Larson, an associate professor who studies water policy and land management at Arizona State University. Metro Phoenix Cities Encourage Homeowners To Scrap The Lawn, But Is It Worth It? Forget dried up reservoirs or fallow fields. The dying lawn persists as one of the most potent cultural symbols of water scarcity in the Southwest. Typically, more than half of a household’s water in Phoenix goes to its grass. “The first large-scale use of water in California was for mining,” says U.C. Berkeley Professor of Environmental and Resource Economics, Michael Hanemann. Hanemann is writing a book on California’s water rights – and how this paper-to-tree system took hold. When miners showed up in California in 1849, they looked for gold in streams and rivers. And they posted dated notices near the places they were looking to call dibs. “We’ve been focused on central Arizona and Phoenix over the last decade and we’ve developed strategies and solutions that have been useful for water management under climate adaptation here in this city, and we feel may be useful in other cities,” said Dave White, DCDC director. DCDC researchers Erik Johnston and Ajay Vinze awarded $449,000 from NSF. An Arizona State University team has received a three-year grant to study how people collaborate – or not – on the complex decision of who gets how much water, and how using technology might affect their reactions. ASU News announces NSF renewal award for DCDC. Water managers and decision makers of cities of the Colorado River Basin will be able to take greater advantage of Arizona State University’s Decision Center for a Desert City thanks to a new $4.5 million National Science Foundation award. Kelsey Wharton of ASU News interviews Dave White. By connecting decision makers across disciplines and developing tools to navigate complex issues, the Foresight Initiative is building a foundation for addressing the increasingly “wicked” nature of our global challenges and educating the leaders who will rise to meet these challenges. Kevin Pollock of City University London interviews Dave White and Rimjhim Aggarwal. An interesting discussion about cities, food production, and the future of agriculture globally.Read more from Kevin Pollock. ASU’s Chris Weir summarizes a KJZZ interview with Dave White. An executive order for water use reductions issued by California Gov. Jerry Brown has many Arizonans questioning our own water future. Kimberleigh Holsclaw of ASU’s Cronkite News interviews David Sampson. The gray water system at Reid Park Zoo’s Learning Conservation Center complements a catchment system through which rain that hits the roof is used in its toilets, reducing the use of potable water inside by about half. Both systems tie into the zoo’s overall conservation efforts, said Vivian VanPeenen, a zoo spokeswoman. KJZZ’s Steve Goldstein interviews Dave White. A little more than a week ago, California Governor Jerry Brown announced the state needed to make major cutbacks in water usage to deal with the effects of drought. Former director of the Arizona Department of Water Resources, Rita Maguire and Dave White talked about how that could impact Arizona and whether we are on the verge of having to cut back on how much water we use. Radio KTAR’s Bruce St. James and Pamela Hughes interview Ray Quay. California’s severe water shortage and Arizona’s forward-thinking water management. Interview at 10:05-16:34 time signature. For his scholarship in the area of shared water resources, ASU hydrologist Enrique Vivoni has been awarded a 2015 Leopold Leadership Fellowship. Arizona Republic’s Brenna Goth interviews DCDC director, Dave White, among others. Under a new agreement, Arizona agencies will work with Nevada, California and the federal government to store water in Lake Mead. Residential users in Arizona are not expected to be affected by the reductions. No one knows exactly how a shortage would play out, but Arizona will be the first to face cuts based on its junior priority to California. Reductions would hit farmers before cities like Phoenix that depend on the Colorado River supply. 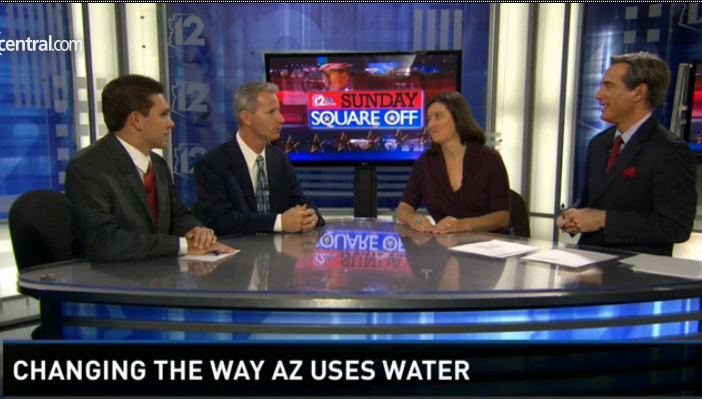 Phoenix Channel 12 News, Sunday Square Off with Brahm Resnick discusses Arizona’s water future with his panel including DCDC director, Dave White, policy analyst Jocelyn Gibbon, and 12 News’ Dr. Matt Pace. Arizona Water Supply: How Worried Should You Be? Amid a depleted water supply and a historic drought, will Arizona run short of water? The water forecasters say Arizona’s water supply will run short of demand in the near future. The ‘Sunday Square Off’ panel debates whether the big ideas to create more water would really work. Arizona Water Challenge: Myths, reality of how to conserve. The Sunday Square Off panel debate the myths and reality of how to conserve water in an era when supply won’t meet future demand. Steve Goldstein interviews Ray Quay on KJZZ. This week, Phoenix has been the host city for the Water Resource and Irrigation Conference. Irrigation has been a method for bringing water to Valley homes for decades. But in a desert made even drier by a near-historic drought, how much of role should irrigation still be playing? We asked Ray Quay of ASU’s Decision Center for a Desert City. Jim Carlton of the Wall Street Journal interviews Dave White, Ray Quay, and David Sampson. University access or subscription required. A recent agreement by this city and Tucson, Ariz., highlights a growing trend in the drought-plagued Southwest: water agencies sharing resources to stretch limited supplies rather than going it alone. Phoenix, which gets more water than it can store from the Colorado River, has agreed to send some of its surplus to Tucson, which needs it to lower pumping costs. In return, Tucson will give up part of its share of Colorado River water to Phoenix when needed. The deal finalized in early October comes despite long-standing rivalries between Arizona’s two largest cities. Phoenix and Tucson have entered an agreement for Phoenix to store its excess Colorado River water in Tucson. The agreement is of mutual benefit to both cities. Arizona State University associate professor Dave White, who heads the Decision Center for a Desert City and studies water management decisions, will discuss the agreement. The fact that the drought is nowhere near ending means the hard times will only get worse, said Michael Hanemann, an environmental economist at Arizona State University. A new water agreement between Phoenix and Tucson could lead to similar arrangements between other Western cities, in response to drought conditions. Sustainability Scientist Dave White, who is Co-Director of ASU’s Decision Center for a Desert City, told us uncommon collaborations will be vital in the future. Arizona water experts says the state could face water rationing as soon as 2015 as a historic drought drains the Valley’s primary source of water, Lake Mead. But the state’s water management agency says homeowners wouldn’t be affect by rationing. What will the future hold for Glen Canyon Dam? Activists are still hoping to see dam demolished, lake drained in hopes of restoring majestic canyon. The hiss of sprinklers serenades improbably green neighborhoods early in the morning and late at night, the moisture guarding against the oppressive heat. This is the time of year when temperatures soar, water consumption spikes and water bills skyrocket in this city, particularly for those whose idea of desert living includes cultivating a healthy expanse of grass. The desert Southwest: oasis or mirage? The American West has a drinking problem. On farms and in cities, we are guzzling water at an alarming rate. Scientists say that to live sustainably, we should use no more than 40 percent of the water from the Colorado River Basin. As it is now, we use 76 percent, nearly double the sustainable benchmark.